Why not start growing vegetables in containers. It’s easy and comes with less fuss. You don’t have to worry so much about soil pests, heavy clay problems, digging and weeding. Have you ever said to yourself, I want to grow some vegetables but I don’t have enough space? …Well even if you’re considering starting small, a container vegetable garden can be an excellent start for you. We’re going to discuss a wide variety of vegetables along with some easy growing tips. Can I Grow Any Vegetable? The good thing about about growing vegetables in containers is that you can grow any vegetable. The first thing you do is to take note of some guidelines. Ensure that the containers are very deep to cater for root vegetables such as main crop carrots, parsnips and potatoes. It’s ok if you just want to grow your favorite vegetables alone because it’s definitely worth it. Once they’re given enough sun, soil and water, you can achieve success with them and that’s definitely the idea. Spring onions- Onions are really good to grow. Mild-flavored varieties are picked when the bulbs are still small. 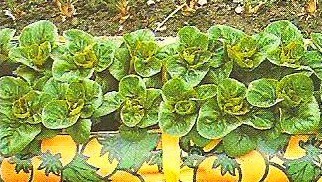 In a growing bag, sow seeds thinly ½ inch deep in 4 inch wide rows. The best time to sow is during March-July. Ensure that you thin the seedlings in such a way to leave 1 inch in spacing. Harvest when the bulbs are about 2 cm (3/4 inch) in diameter. 2) The loose leafy varieties that comes with a frilly appearance and contains red or bronzy leaves. I prefer the loose leafy ones, they taste and look better. This type is ideal for mixed plantings with bedding plants. You can remove a few of the leaves from the loose-leafy variety. This can be done on a cut and come again basis. Sow seeds ½ inch deep anytime during the April-May period. As soon as the first seedlings appear, thin them to ensure that there isn’t any overcrowding. You can even use a growing bag if you like. It will be able to hold about 12 plants. 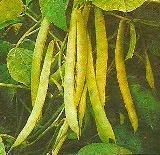 French Beans- These are standard varieties that are referred to as bushy plants with red, white or pink flowers. Their pods are 4-6 inches (10-15cm) in length. Their varieties consist of purple, yellow-podded types as well as the climbing ones. A growing bag is a good choice for this vegetable. It will be able to hold about 8-12 plants. Sow the seeds at about 2 inches deep in early June. Use short twigs to provide the stems with support. The climbing varieties usually grow about 5 feet (150cm) high and will require some solid support. You can begin to pick the pods when they are about 4 inches long. These are definitely worth trying in the container vegetable garden. A sheltered and sunny spot is the ideal location. It’s really cool to pick these fruits straight from the plant and they usually taste better than the greenhouse ones. When it comes to growing vegetables in containers tomatoes are one of the best vegetables to grow. You can take a look at growing tomatoes to read more on how to produce some big, succulent juicy tomatoes. Cucumbers are referred to as climbers and ramblers. They grow extremely well once they are kept fully-watered. These come with a variety which consist of smooth skins with a delicious flavor and resembles the greenhouse ones. Cucumbers are really good choices for growing bags or tubs and must be grown in a sunny location. At the centre of the container, or in a growing bag planting pocket, sow 3 seeds 1 inch deep and a few inches apart. Do this at around late May-early June. Thin in such a way to leave the strongest seedling. When the plant has developed 6 or 7 leaves, pinch out the growing tip. Side-shoots will develop and always remember to try to keep the soil moist. When watering, water around the plants and not over them. Remove the fruits when they are about 8 inches (20cm) in length using a sharp knife. These are just a few of the best vegetables to choose when growing vegetables in containers and better yet, they're easy to grow. Growing vegetables in containers is an excellent method for beginners and those who have limited space. Growing vegetables in containers also allow some form of creativity and style into gardening. It also makes the working aspect pretty easy. Therefore, don’t let your situation of limited space hold you back as you can opt for growing vegetables in containers and use it to your advantage.